An award-winning LSBU initiative is helping current students benefit from the skills and experience of their predecessors when it comes to finding placements and jobs. Started by Mel Godfrey in 2005, the scheme – coined a 'Give-Back culture' – harnesses the experience, skills, networks and passion of LSBU Marketing alumni for the benefit of those still studying. "Involving our alumni as closely as we do makes our students much more employable," explains senior marketing lecturer Kim Roberts. "It means our alumni let us know about jobs and internship vacancies at the companies they work for now. They encourage our marketing students to apply when posts are advertised because they know just how good our students and graduates are. Our alumni are also keen to pass on their experience first-hand, and many of them return to deliver guest lectures or provide live briefs for our students." 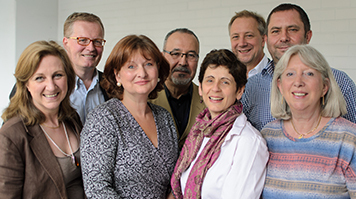 The academic teaching team even involves alumni in the development of new marketing courses. For example, graduates advised the development of the MSc Digital Marketing and MSc Marketing Communications courses, with a senior partner at Ogilvy (another alumni) joining the validation panel. "Their input helps us to make sure that we stay at the cutting edge of marketing education," says Kim. "Ultimately, everything we do is geared around helping our students embark on the marketing careers they dream of. Our alumni help us to produce graduates that are not only well-equipped for the challenges currently facing the marketing profession, but understand the skills that will be needed in the future as well." The guest lectures in particular offer a genuine insight into the specific skills that students need to succeed in their applications. "Our alumni pass on the benefit of their experience at various companies, helping current students to prepare for their careers and focus on what is really important," says Kim. The live brief exercises that alumni have also become involved with add further practical skills to LSBU students' skillsets. In recent years, alumni working at organisations such as Ogilvy and Ipsos MORI have visited LSBU to set live briefs for marketing students, with some spectacular results. "Ipsos MORI was a great example of the Give-Back culture working at its best," says Kim. "The winning group of students created such an impression with those judging the brief that they were invited to visit Ipsos MORI and deliver the pitch directly to the board. The board was similarly impressed, and advised every student in the group to apply for their year-long internships, because "they want graduates of this professional calibre". That shows just how beneficial it can be to bring our alumni and our students together for the benefit of all." Students and alumni continue to be encouraged to connect with each other on Facebook and LinkedIn, with the LSBU marketing teaching team posting jobs from alumni via its marketing Facebook group. "It's an amazing resource," says Kim. "We actually started doing this a long time before it became common practice – Mel Godfrey showed great foresight in using social network sites almost ten years ago, and with colleague Anita Peleg built on that promising start. For example, up to 35 alumni attend our annual marketing careers evening, where both under-graduates and post-graduate students enjoy guest lectures from practitioners; an alumni forum to help hone student employability skills and during networking, students also often hear about jobs first hand. Now we are all involved, and it is absolutely at the core of all our marketing courses. The involvement of alumni doesn't just benefit the students either – their insights and understanding help the academic team to improve how we deliver our programmes too." It's an approach that is already showing a significant return. Aside from the team's recent Team Teaching Excellence Academy of Marketing Award 2014, the initiative results in between 60 and 80 opportunities per year for current students and recent graduates. These include permanent roles, internships and shadowing and have helped LSBU students stay ahead of the crowd when it comes to finding employment both now and for years to come.